For over a decade Vembu have been offering industry recognized, enterprise level data protection solutions; priced within reach of small and medium datacenters. Now providing exceptional service and value to over 60,000 businesses in over 100 countries, Vembu continues to grow its portfolio of software products and cloud services. Vembu’s BDR Suite serves as the companies flagship product line, made up of software catering for small to medium businesses and service providers alike. Vembu continue to lead innovation in data protection by introducing Backup as a Service, Disaster Recovery as a Service, and Cloud backups, replication, and DR alongside their in-house solutions. The backup and disaster recovery market is much larger and more complexed than it is actually conceived to be. What really matters in the event of disruption to business continuity or unprecedented disasters  is a reliable and scalable solution with a simple interface, military grade security, hybrid deployment options, easier recovery options and many such parameters which will keep business operations intact, no matter what. Despite this, small and medium businesses have a steady challenge of scaling up their IT requirements while keeping their IT costs in check. A datacenter might have multiple backup requirements, be it virtualized, physical, legacy or needing hybrid deployment options. For all the aforementioned requirements, Vembu BDR Suite provides one of the most comprehensive, simple and affordable backup and disaster recovery solutions for small and medium businesses. Vembu can backup VMware vSphere, Microsoft Hyper-V, physical servers, workstations, Exchange items, SharePoint items, SQL items, Office365, G Suite, etc. – and backup destinations can be on-site, off-site, or even to the cloud – not to mention that most of this is done within a single UI. Aside from the BDR Suite, Vembu offers a wide variety of products such as a monitoring solution to centralize the monitoring of all of your backups as well as some which are absolutely free such as desktop/laptop image backup and the Vembu Universal Explorer for discovering application items within Microsoft apps. It is important to note that Vembu BDR Suite is offered as a single edition software for all businesses unlike other backup vendors who provide editions with limitations based on the type of businesses. 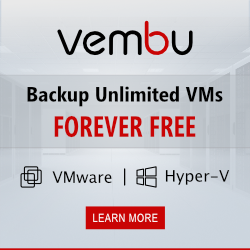 Vembu has come up with its own free edition of Vembu BDR Suite by which users can backup unlimited VMs with minimal feature restrictions. Vembu ImageBackup; part of Vembu BDR Suite is a complete backup and disaster recovery solution for Windows IT environments. It provides the option of system level backups or specific file level backups for Windows Servers and workstations. It also ensures RTO less than 15 minutes by delivering reliable recovery options like bare metal recovery, quick VM recovery, instant file recovery, partition level recovery etc. 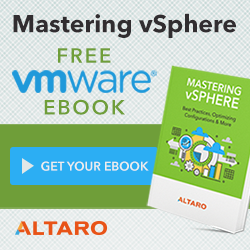 Furthermore, backing up desktops and laptops is completely free. Vembu NetworkBackup; part of Vembu BDR Suite is designed for small and medium businesses to protect business data across file servers, application servers, workstations and other endpoints. With NetworkBackup businesses can backup all their systems to a central location which is easier to manage. Vembu OnlineBackup; part of Vembu BDR Suite provides file server, MS Exchange, MS SQL, MS SharePoint & MS Outlook backups directly to Vembu’s secure cloud using enterprise-grade AES 256-bit encryption with granular restores. Vembu SaaSBackup; part of Vembu BDR Suite is designed for backing up Office 365 mail, drives, calendar and contacts, as well as Google Apps. Vembu SaaSBackup’s core system will manage all backup and restore operations at the users request. The backup data will be sent to the Vembu Cloud storage over a secured network.